The world’s food system is on the wrong trajectory. Most of the world’s population eats too little, too much, or the wrong type of food – at an unsustainable cost to the environment, health, and political stability. Achieving the Sustainable Development Goals (SDGs) depends on a food system simultaneously capable of delivering greater volumes of more nutritious food with a lower environmental footprint. Improving the food system to ensure an adequate and nutritious diet, especially for the world’s most vulnerable people, is at the core of CGIAR’s mission. If we can’t fix our food system, we will not achieve the SDGs. We want to play a central role in driving a shift in food systems so that they are more sustainable, more productive and benefit populations across the world. Agricultural research is a smart and critical investment – one that global society neglects at its peril. As world events again demonstrated in 2017, poverty and hunger have ramifications that are far-reaching and potentially explosive, and sustainable food production itself is inextricably linked to a host of factors that include environmental conservation, climate change, market access and equitable conditions for both women and men. With a strong asset base in terms of skills, science and worldwide reach thanks to its unique research for development partnership network, CGIAR is uniquely positioned to respond to today’s pressing global challenges of food insecurity, environmental degradation, unequal prosperity, a changing climate, and the nutrition-related disease burden. Producing more nutritious food with a lower environmental footprint requires collective action and opening up new opportunities for dynamic innovation. Agricultural research offers the opportunity for a single investment that provides multiple benefits. Investment in CGIAR expertise and our unique assets will ensure we can provide long-term value to the world. Determined to rise to the challenge, CGIAR is working hard to build more effective partnerships, with strengthened funding for sustainable, transformational impact, based on the triad that forms the core of all its research: partnership, transparency and accountability. 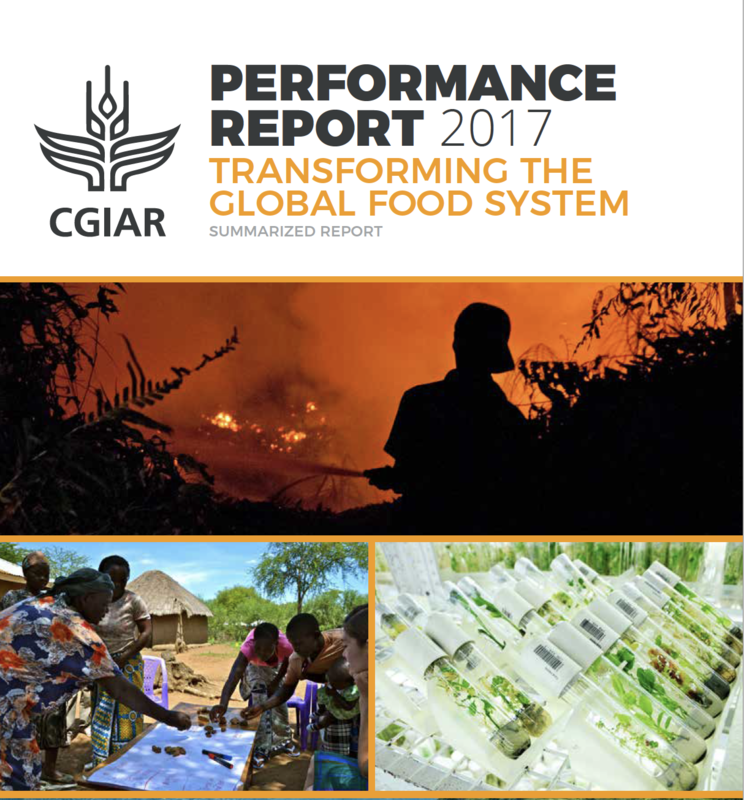 To ensure accountability, CGIAR is focusing on enhancing performance and strengthening the quality of its reporting. 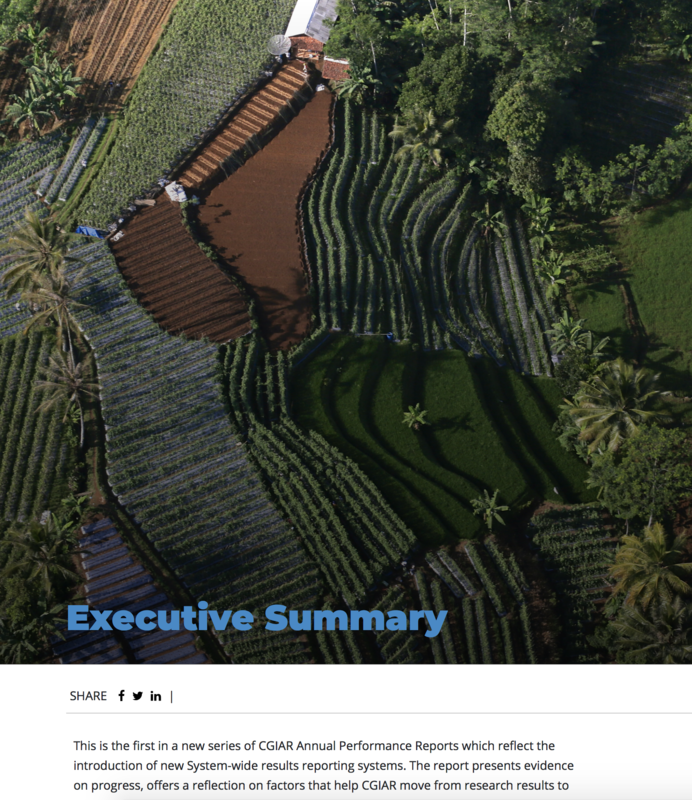 During this past year, CGIAR’s new governance structure has demonstrated results, highlighting the value of working together across the whole System – taking tough decisions and setting clear directions for continued improvement. a grant of USD 15 million to the HarvestPlus Biofortification Program, enabling it to advance its ground-breaking research on developing methods to enrich some basic staples with micronutrients – work that is now being scaled up through novel alliances with the private sector, government, and civil society. The release of more than 200 new improved crop varieties and other technical innovations (CGIAR Innovations in 2017), the publication of approximately 1,750 peer-reviewed research papers of which more than 60% are openly accessible (CRP Publications in 2017), and the continued massive genomic characterization of crop accessions stored in 11 CGIAR Genebanks are just some of the successes scored by CGIAR Research Programs and Platforms in 2017. The year ended on a high note with CGIAR receiving a United Nations Framework Convention on Climate Change (UNFCCC) Momentum for Change award for groundbreaking science on climate-informed advisories and big data, the results of which are now being rolled out to hundreds of thousands of farmers in Colombia and Honduras. CGIAR’s achievements in 2017 have been made against a backdrop of pressure on funding, albeit tempered by the generosity of CGIAR’s Funders who have continued to support the case for international agricultural research. A stable investment base is essential for long-term planning and impact, so securing reliable and diverse financing remains a key challenge. Global funding for agricultural research must be sustained, otherwise more than our food supply could be at risk: employment, peace, gender equality, and efforts to combat climate change would likely also become casualties. CGIAR is dedicated to reducing poverty, enhancing food and nutrition security, and improving natural resources. The challenge is to attract the funding that is the foundation for all CGIAR research. Moving forward, CGIAR will continue to sharpen its focus on how to increase relevance and impact in a rapidly changing context, where business-as-usual approaches are no longer an option.